Video Below has several interest topics including the anomalies in Vince Foster’s Alleged Suicide. This is the story that nobody dares touch. This is the story that ended my career in Hollywood back in 1994. Despite having reported the discovery of Dr. Haut’s signed report confirming the existence of a second wound to Vincent Foster’s neck, radio host Rush Limbaugh to this very day refers to Vincent Foster’s death as a suicide. Even Matt Drudge, when presented with the FBI records proving that the FBI fraudulently manufactured Lisa Foster’s recognition of the gun found at Fort Marcy Park, refused to get involved, opting instead for a story accusing Sidney Blumenthal of domestic violence (for which Drudge was then sued and made famous). Courtesy of a reader in Toronto. It only took them twenty years to catch up with me, but it is nice to see! So, what would had happened if Rush Limbuagh and Matt Druge, not to mention ABCNNBBCBS had had the courage to report this story back in 1994? I would have kept my film career, of course, but beyond that, we might have avoided three Presidential administrations convinced that they could do whatever they wanted to do and get away with it, whether it was murdering the White House Deputy Council, lying about Saddam’s nuclear weapons to start a war of conquest, or scamming us all with 9-11, or human-caused global warming, Obamacare, etc. Pat Knowlton’s audio tapes of Miguel Rodriguez confirming the deceptions and cover-up in the Vince Foster Case. UPDATE: Allan Favish’s FOIA yields more photos. Allan Favish’s Freedom Of Information Act lawsuit achieved a breakthrough recently when a Federal District Judge ordered 5 of the 10 crime scene Polaroid photographs released. One of these is no doubt the photo of the dark blued steel revolver and Foster’s hand previously leaked by the White House to Reuter’s News Service. But the other four are photos not publicly seen before. Here is the judge’s order. Click for full size page 1. Click for full size page 2. 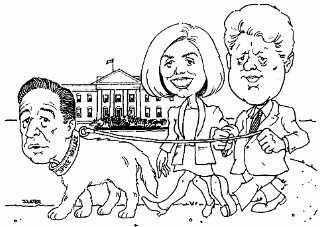 On July 20, 1993, six months to the day after Bill Clinton took office as President of the United States, the White House Deputy Council, Vincent Foster, told his secretary Deborah Gorham, “I’ll be right back”. He then walked out of his office, after offering his co-worker Linda Tripp, the leftover M&Ms from his lunch tray. That was the last time Vincent Foster was seen alive. 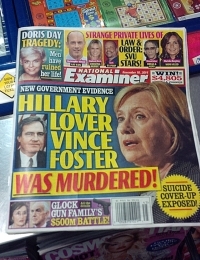 Contrary to the White House spin, Vincent Foster’s connection to the Clinton’s was primarily via Hillary, rather than Bill. Vincent and Hillary had been partners together at the rose law firm, and allegations of an ongoing affair had persisted from the Little Rock days to the White House itself. But Vincent’s position at the White House did not sit well with him. Only days before, following a public speech stressing the value of personal integrity, he had confided in friends and family that he was thinking of resigning his position. Foster had even written an outline for his letter of resignation, thought by this writer to have been used as the center portion of the fake “suicide note”. Foster had scheduled a private meeting with Bill Clinton for the very next day, July 21, 1993 at which it appeared Foster intended to resign. Vincent Foster had spent the morning making “busy work” in his office and had been in attendance at the White House announcement of Louis Freeh as the new head of the FBI earlier in the day (passing by the checkpoint manned by White House uniformed guard Styles). This is a key point. The White House is the most secure private residence in the world, equipped with a sophisticated entry control system and video surveillance system installed by the Mitre Corporation. Yet no record exists that Vincent Foster left the White House under his own power on July 20th, 1993. No video of him exiting the building exists. No logbook entry shows he checked out of the White House. Several hours after he was last seen inside the White House, Vincent Foster was found dead in Fort Marcy Park, in a Virginia suburb just outside Washington D.C. The death was ruled a suicide (the first major Washington suicide since Secretary of Defense James Forrestal in 1949), but almost immediately rumors began to circulate that the story of a suicide was just a cover-up for something much worse. The first witness to find the body insisted that there had been no gun near the body. The memory in Foster’s pager had been erased. Critical evidence began to vanish. Many witnesses were harassed. Others were simply ignored. 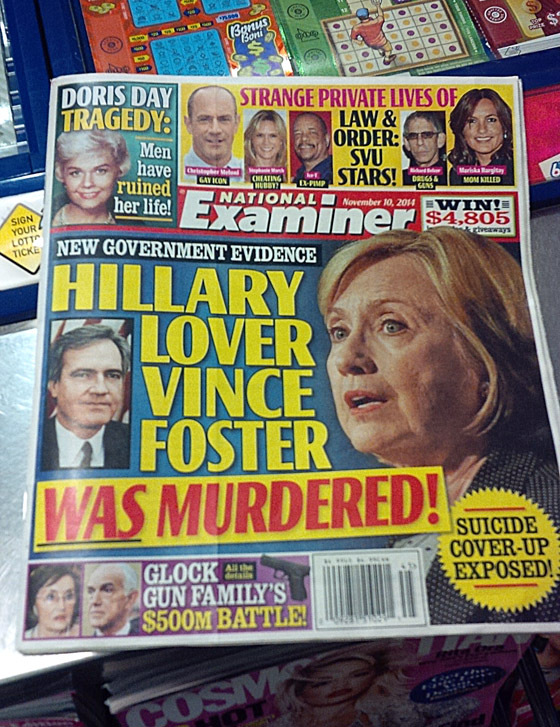 There were even suggestions that the body had been moved, and a Secret Service memo surfaced which reported that Foster’s body had been found in his car! The official reports were self-contradictory. While the U.S. Park Police (a unit not equipped for a proper homicide investigation) studied the body, Foster’s office at the White House was being looted. Secret Service agent Henry O’ Neill watched as Hillary Clinton’s chief of staff, Margaret Williams, carried boxes of papers out of Vincent Foster’s office before the Park Police showed up to seal it. Amazing when you consider that the official identification of Vincent Foster’s body by Craig Livingstone did not take place until 10PM! Speaking of Craig Livingstone, another Secret Serviceman saw him remove items from Vincent Foster’s office in violation of the official seal. Witnesses also saw Bernard Nussbaum in Foster’s office as well. Three witnesses noted that Patsy Thomason, director of the White House’s Office of Administration, was desperate to find the combination to Vincent Foster’s safe. Ms. Thomason finally opened the safe, apparently with the help of a special “MIG” technical team signed into the White House in the late hours. Two envelopes reported to be in the safe by Foster’s secretary Deborah Gorham, addressed to Janet Reno and to William Kennedy III, were never seen again. When asked the next day regarding rumors of the safe opening, Mack McLarty told reporters Foster’s office did not even have a safe, a claim immediately shot down by former occupants of that office. The next day, when the Park Police arrived for the official search of Vincent Foster’s office, they were shocked to learn that Nussbaum, Thomason and Williams had entered the office. Conflicts channeled through Janet Reno’s Department of Justice resulted in the Park Police merely sitting outside Foster’s office while Bernard Nussbaum continued his own search of Foster’s office. During this search, he opened and upended Vincent Foster’s briefcase, showing it to be empty. Three days later, it would be claimed that this same briefcase was where the torn up suicide note was discovered. The boxes of documents removed from Foster’s office by Hillary Clinton’s chief of staff, Margaret Williams, were taken to the private residence area of the White House! Eventually, only 54 pages emerged. One set of billing records, under subpoena for two years, and thought to have originated in Foster’s office, turned up unexpectedly in the private quarters of the White House, with Hillary’s fingerprints on them! So, who ordered the office looting? Bill Clinton was unavailable, being on camera with Larry King. But Hillary Clinton, who had only the day before diverted her planned return to Washington D.C. to Little Rock, was on the phone from Little Rock to someone at the White House in the moments before the looting took place. (2) The position of the arms and legs of the corpse were drastically inconsistent with suicide. 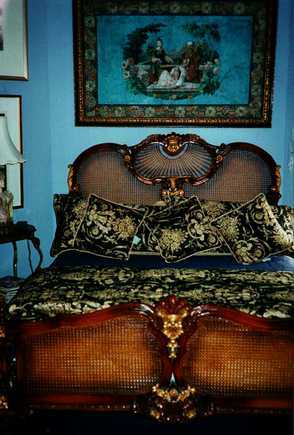 (4) VWF’s body was probably in contact with one or more carpets prior to his death. The team was amazed that the carpet in the trunk of VF’s care had not been studied to see whether he had been carried to the park in the trunk of his own car. (5) The force of the gun’s discharge probably knocked VF’s glasses flying; however, it is “inconceivable” that they could have traveled 13 feet through foliage to the site where they were found; ergo, the scene probably was tampered with. (6) The lack of blood and brain tissue at the site suggests VF was carried to the scene. The peculiar tracking pattern of the blood on his right cheek also suggests that he was moved. Despite numerous official assurances that Vincent Foster really did commit suicide, more and more Americans, over 70% at the last count, no longer believe the official story. TV specials, most notably the one put out by A&E’s “Inside Investigations” with Bill Kurtis, have failed to answer the lingering questions, indeed have engaged in deliberate fraud to try to dismiss the evidence that points to a cover-up. This web site is built primarily from official records, newspaper reports, and other hard data. Careful analysis of those records reveals a pattern of deliberate obfuscation surrounding Vincent Foster’s death. This pattern of obfuscation, this cover-up, is a matter that should concern all Americans, not because of what it means for Vincent Foster, but because of what it means for the rest of us. One thing is for certain. As we approach the fifth anniversary of this crime, it is clear from the amount of resources being brought to bear by the government that there is something about this particular crime that has made those in power very afraid. With the latest Zogby Poll revealing that the majority of Americans no longer believe the official claim of suicide, the perpetuation of the cover-up must be to prevent an examination of the motive, why was Vincent Foster murdered and his body dumped in Fort Marcy Park? NEW! Photo of Vince Foster’s shirt after he was removed from Fort Marcy Park proves Foster had to have been shot where he was found. One of the many false trails put out by government disinformation operatives was the claim that Vince Foster really did kill himself but did so someplace embarrassing and his body was moved to Fort Marcy Park post-mortem, explaining away the many inconsistencies in the evidence of a suicide at Fort Marcy Park itself. Contradicting that claim was the observation that, while the body was rather bloodless as found (suggesting that Foster was already dead by other means when a gun was fired into his mouth to simulate a suicide) once paramedics moved the body, blood poured from the wounds, staining Foster’s shirt. 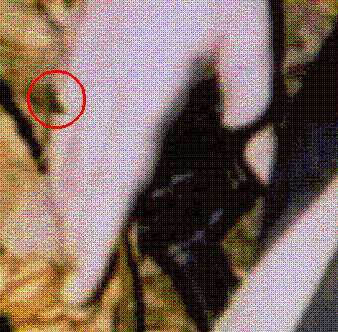 The above photo is of Vince Foster’s shirt after it had been removed from his body at the Morgue. As can clearly be seen, the process of moving the body resulted in a great deal of blood flow from the head wounds. This proves that the gunshot wound to the head, although most likely post-mortem, was inflicted exactly where the body was found at Fort Marcy Park. On Friday, March 11, 1994, in response to rumors which were even then beginning to circulate regarding Foster’s death, ABC News broadcast the following photograph, which had been leaked by the White House to Reuter’s news agency. The intent was to reinforce the claim that Foster’s death had indeed been a suicide. The photo did not have the intended effect. Click for full size picture. I was not a political activist at the time, nor did I ever intend to become one. My career is in feature film and TV visual effects, which I have been doing for almost forty years. I know about film fakery. And the instant I saw the above photo on TV I turned to my wife and said to her half jokingly, “This is staged! If I did work this sloppy I wouldn’t be working.” But the more I thought about it, the less funny it all seemed. There are several troubling aspects in this photograph, which reveal it to be a staged shot. First and foremost among them the total lack of blood anywhere in the scene. This lack of blood is the single, strongest proof that Vincent Foster did NOT put the gun into his own mouth and pulls the trigger. Had he done so, the blowback from the gunshot would have coated the gun, hand, and white sleeve of Foster’s shirt with a spray of blood and organic matter. None appears in the photo anywhere. The FBI lab report reveals that even with the most sensitive chemical test available, no blood was found on the gun that Foster (we are told) inserted into his mouth and fired. Not only that, Foster’s fingerprints were not on the gun. This is the crux of the suicide theory put forward by the government, that Vincent Foster, under stress, on a hot July day, put the barrel of a .38 revolver into his mouth and pulled the trigger, and did not leave blood OR FINGERPRINTS on that gun. Click here for the official documents. Was Foster already dead when the headshot was fired? One of the key pieces of information that argued against suicide was the lack of blood at the scene. When the brain is destroyed, the heart will continue to beat on its own, for as long as it has oxygenated blood to feed it. This is why head trauma victims provide most donor hearts. The heart remains alive as long as blood is still in the body. In the case of a gunshot into the mouth, the bullet has to pass through the sinus cavities. Any child who has been in a schoolyard fight knows how easy it is for the nose to start bleeding and how hard it can be to stop. Had Foster really shot himself in the mouth, his heart would have continued to beat, pumping most of his blood out through the shattered sinus cavities and the entrance wound in his mouth, as well as out through the supposed exit wound. But this did not happen. Witnesses at the scene reported a “trickle” of blood from the mouth and nose (one of the tracks appeared to have flowed up hill). As can be seen by the above video, after a gunshot through the head, the heart continues to pump blood out the mouth and nose. The front of Foster’s clothing should have been soaked with blood as the heart continued to beat. This did not happen. This indicates that Foster’s heart was already stopped when the gunshot into the mouth was fired to mask the real cause of death. References regarding how the heart behaves following traumatic brain death. Robert Fiske was the first Independent Council appointed to investigate the Whitewater scandal. For a variety of reasons, including his past association with BCCI (a failed bank involved with the laundering of drug money), Fiske was considered by many unsuitable to investigate the various failed S&L in the Whitewater affair (many of which also appear to have been involved with the laundering of drug money) and Fiske was eventually replaced by Kenneth Starr. The Preliminary Report On Vincent Foster by Robert Fiske. Note that Fiske’s report was only preliminary. 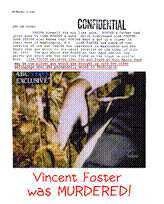 His final report on Vincent Foster remains sealed. When the Wall Street Journal filed a Freedom Of Information Act request to force the release of Fiske’s final report, the court, in an unprecedented prior restraint, ordered the Wall Street Journal not to report on the case, or to even mention what the final ruling actually was. This illegal prior restraint is one of the indicators, which reveals how terrified the government is of the facts behind the death of Vincent Foster. No sooner had the preliminary Fiske report been issued than it met with immediate criticism, even from the U.S. House of Representatives. Careful analysis of the report by private citizens, typified by Hugh Sprunt’s “Citizen’s Investigative Report” revealed dozens and dozens of obvious and clumsy contradictions. Yet another outstanding series of articles was written by Dave Martin called, “America’s Dreyfus Affair”. Among the most damning pieces of evidence to emerge from the official records was the deliberate and fraudulent manufacturing of the testimony of Lisa Foster in regards to the gun found with Vincent Foster’s body. Vincent Foster was found with a .38 revolver made by Colt Arms. It was built from parts taken from two other guns, and as a result had two serial numbers. The Frame number was 355055, and according to the records of the Colt Arms Company , the gun was manufactured with a standard dark blue, almost black, finish. In the Park Police record, the gun is described as black. The accompanying photographs in the Park police report show a black gun. The photograph leaked by the White House to ABC-TV also shows a dark gun. Compare the reflectivity of the gun to Foster’s gold ring on his finger, just an inch away. In all the statements by the Fort Marcy Park witnesses, in the Park Police reports, in the reports by experts at the FBI and ballistics lab, the gun is never described as anything but dark blue or (more often) black. The photographs recently obtained in Allan Favish’s FOIA lawsuit clearly show a dark surface to the gun. No connection exists between that gun and Vincent Foster. Foster’s fingerprints were not on the gun. Neither was any of his blood . 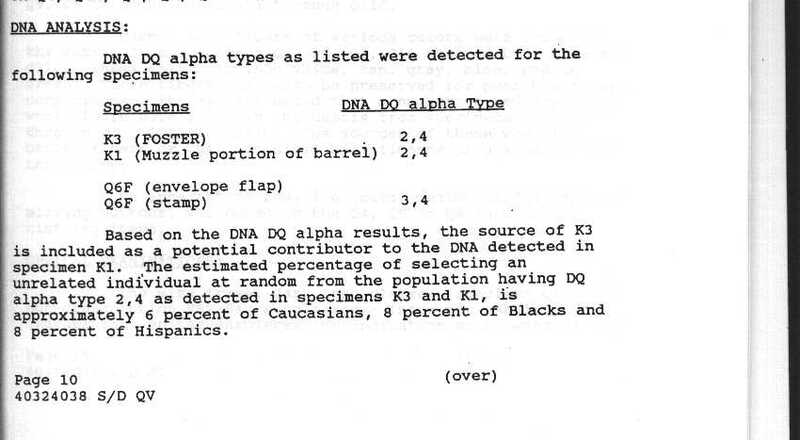 The DNA traces on the gun, while “not inconsistent” with Foster, were more likely to have originated with a black or a Hispanic than with a Caucasian. No gunpowder or bullet fragments were found in Foster’s wounds that could be matched to the gun! Despite this, Robert Fiske inserted a comment on page 38 of his report on Foster; a statement that Lisa Foster thought the gun found with her husband was one she had brought up from Little Rock, Arkansas. This statement came from an interview of Lisa Foster conducted by the FBI on May 9th, 1994, more than nine months after Vincent Foster’s death. 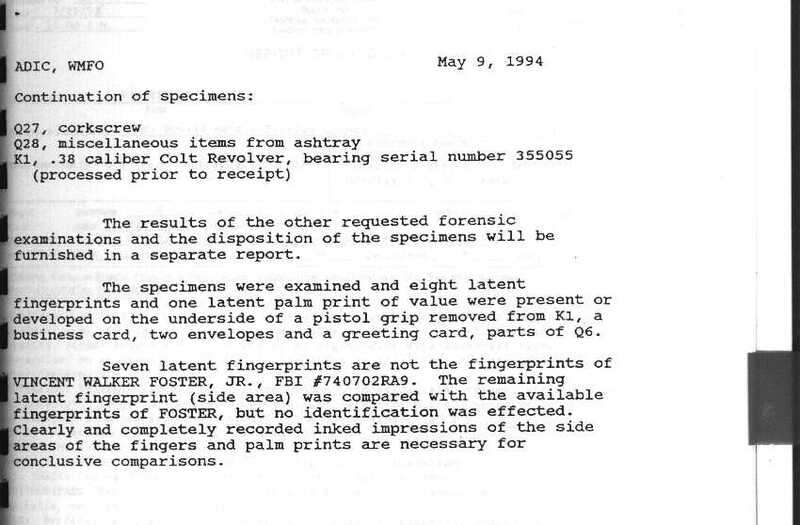 In the handwritten notes and final FD-302a report of the interview, the interviewing FBI agents describe the gun being shown to Lisa Foster as “silver colored”, not just once, but many times. The gun is never described as dark blue or black. In order for Lisa Foster to believe that the gun presented to her as the Fort Marcy Park gun might be the family silver gun, the gun presented as the Fort Marcy Park gun must also be silver. Lisa Foster doesn’t have to be a gun expert to know that silver is not black. From the official record, its clear that Lisa Foster was shown a gun she recognized as the gun she brought up from Little Rock, but its equally clear that this is not the same gun as that found with Vincent Foster. Black is not silver. CLICK HERE TO REVIEW THE OFFICIAL RECORDS THAT PROVE THE FBI MANUFACTURED LISA FOSTER’S TESTIMONY. The credibility of the suicide claim took another hit when one of the witnesses at Fort Marcy Park, Patrick Knowlton, came forward to claim that the FBI had altered his testimony. Patrick was then harassed and threatened, which prompted the filing of a lawsuit for witness tampering. 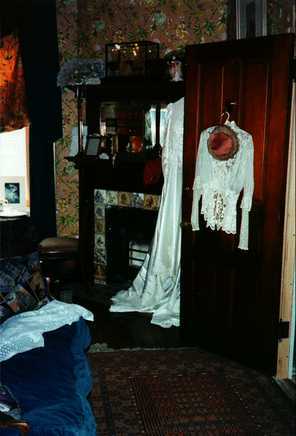 The White House had come forward to claim that they were not notified of the discovery of Vincent Foster’s body until quite late in the evening. This was a critical item relating to when Vincent Foster’s office was officially sealed for the investigation and (as it later came out) when it was being looted of records. But two Arkansas State Troopers put the White House’s official time of notification in doubt. Roger Perry and Larry Patterson had both come forward to report a phone call made from the White House to the Arkansas Governor’s mansion approximately two hours earlier than the White House claimed it had learned of Foster’s death. The Clinton’s nanny, Helen Dicky, made the call. During the Whitewater hearings, Helen placed the call much later, and to bring the issue to an end the committee members announced to all that the “former” troopers had changed their minds and would not testify to receiving the call any earlier than Helen stated. This, of course, was yet another lie. Perry and Patterson were not “former” anything; they were still Arkansas State troopers who had wanted to testify but were kept out. Angered and with no other venue, Perry and Patterson swore out affidavits stating the facts as they knew them. Recently, at the end of her appearance before the Monica Lewinsky Grand Jury, Linda Tripp issued a public statement that hinted at the deceptions behind the death of Vincent Foster. AT LEAST PARTLY A FORGERY. No single item connected to the Foster death has aroused as much controversy as the so-called “suicide” note. This was a note, allegedly written by Vincent Foster and discovered in his briefcase some days after his death. The problem was that Bernard Nussbaum, in controlling the Park Police search of Foster’s office, had shown them that same briefcase empty just two days before. Coupled with that was the fact that the White House did not report the existence of the note for almost 36 hours after it was allegedly discovered. Adding another odd aspect to the note was the great pains taken to conceal it from the public. Even though the text itself had been published, Jim Hamilton made a point, during Lisa Foster’s FBI interview to remind everyone that photos of the note were not to be allowed out, even in response to a Freedom of Information Act Request. Hamilton went to far as to request, in a letter (page 1 – page 2) to Janet Reno, the return of the actual “suicide” note as soon as possible, and thanks her again for refusing to allow photographs of the note to be allowed in public. Such secrecy surrounding a supposed suicide note aroused much curiosity, which was finally satisfied when someone on the inside leaked a photocopy of the note to the Wall Street Journal, which published it. The availability of the note prompted James Davidson at Strategic Investment to commission three of the world’s top document examiners to examine the note. In their report, all three experts judged the note to be a forgery! This hardly came as a surprise. An even cursory examination reveals that at last two different hands worked on that note, suggesting that Foster’s outline for a letter of resignation (for that is what Lisa Foster thought the note had been) was modified. A botched attempt at a signature may have required the strange tearing of the note with the loss of one-piece right where the signature would go. The note had fingerprints on it. Officially, the origin of the prints remains undetermined, but while testifying before the Whitewater committee, the FBI expert reported that one palm print was identified as belonging to Bernard Nussbaum. Virtually the entire case for supposed suicide rests firmly on the autopsy done by Dr. James C. Beyer, a pathologist for Fairfax County, Virginia with strong ties to the FBI. Dr. Bayer’s autopsy report at first reading seems unremarkable. It’s conclusion is that Vincent Foster died of a single gunshot wound entering the roof of the mouth and exiting the back of the skull. But on closer examination, problems become apparent. Dr. Beyer’s co-worker at the Fairfax County, Virginia, medical examiner’s office is Dr. Donald Haut. It was Dr. Haut, not Dr. Beyer, who actually examined Vincent Foster’s body while it was still at Fort Marcy Park, assisted by John Rolla. On page two of Dr. Haut’s signed report, the wound track is described as a “gunshot wound mouth to neck”. This corroborates the eyewitness testimony of EMS Technician Richard Arthur, who described the gunshot wound in some detail, placing it under the right ear. This is consistent with the news story reported by Ambrose Evens-Pritchard, who described a photograph of that wound. Was there really an exit wound out the back of Foster’s head? Prior to the body’s delivery to Beyer, nobody reported a gunshot wound out the back of the head. EMS Sergeant Gonzalas stated he did NOT see a gunshot wound out the back of the head. John Rolla did not report a gunshot wound out the back of the head. Another EMS Technician, Cory Ashford, testified is a tape recorded interview with reporter Chris Ruddythat he was certain there was NO exit wound at the back of the head while Vincent Foster was at Fort Marcy Park! Outside of the obviously altered page one of Dr. Haut’s report, there isn’t a single official record of a gunshot wound exiting the back of Foster’s head while he’s still at Fort Marcy Park. It is not until the body arrives at Dr. Beyer’s morgue that the neck wound seen by Arthur and Haut seems to go away and the wound out the back of the head appears. On the wound description page in the Beyer autopsy, the box for neck wounds has been left blank. But the wound that Beyer DOES describe is rather odd. Supposedly, the wound is the result of a soft nosed unjacketed lead bullet being fired through two dense bones, first at the base of the skull and then at the rear. There should be metal fragments all over the wound track. For a comparison, take a look at the X-ray taken of John F. Kennedy’s skullfollowing his assassination. Metal fragments are seen throughout the interior of the skull, and this is from a full metal jacket round, the type that LIMITS fragmentation! Yet in describing the wound track in Vincent Foster’s head, Beyer notes on page 2 of his report that no metallic fragments were recovered during the examination! There should have been lead scrapings all over the bone perforations, had a soft-nosed lead bullet really made them! More recently, a FBI telex was uncovered which reported that the autopsy conducted by the Fairfax County Medical Examiner had found a bullet entry but NO EXIT WOUND! Beyer himself checked and signed the boxes on his report indicating that X-rays had been taken. Dr. Beyer told Park Police Detective James G. Morrissette that the X-rays showed no bullet fragments at all. Again, with the type of ammunition on the gun wound with Foster’s body, this is impossible. Of course, the X-rays were not to be found. Beyer later claimed that they hadn’t been taken, and that his X-ray machine was broken, although the service records on that machine do not bear out this claim. With the exception of a few Polaroid photos that are currently the subject of Allan Favish’s FOIA lawsuit, no photographs of the crime scene exist. The 35mm photographs taken by the Park Police were supposedly underexposed in the laboratory (although Starr investigator Miquel Rodriguez reportedly used an outside lab to successfully recover images from the film, just prior to his conflict with Mark Touhey and subsequent resignation from the OIC). In addition to the 35mm photos, many more of the Polaroids of the crime scene simply vanished. Rolla testified that the photos were inside the case jacket when the jacket went to Beyer. After it had come back, the photos were gone. Note also that whereas it is normal to have investigators present for the autopsy, the last minute schedule change, moving the Foster up a day, meant that Beyer performed a significant part of the autopsy unobserved. By the time Park Police observers saw the body, Beyer had removed Foster’s entire tongue and upper palette, obliterating the “mouth to neck” gunshot wound Dr. Haut had seen. Clearly, something is very wrong with the autopsy and the preponderance of evidence points to Beyer as author of the deception. Certainly, he was well positioned to tamper with Dr. Haut’s original report, altering the page 1 description. Beyer’s past history isn’t the most reassuring. Indeed he seems to be the Virginia version of the infamous Dr. Fahmy Malek, the Arkansas M.E. who ignored clear evidence of homicide in the deaths of Don Henry and Kevin Ives and in one case ruled that a man who had been beheaded was dead of natural causes. Beyer himself, in the case of Tommy Burkett, ignored a broken jaw in order to rule that Burkett had killed himself with a gun. Despite having shown the autopsy photos to Burkett’s father, Beyer later claimed (as he did with the Foster X-rays) that they had never really existed. After a second autopsy, the case was reopened as a homicide. Likewise, in 1989 there was an autopsy on establishing the death of a man named Tim Easley. Mr. Beyer, the coroner, ruled that Easley killed himself by stabbing himself in the chest. He failed to notice a defensive wound on the man’s hand. The case was reopened, and, after an outside expert reviewed the case, Easley’s girlfriend confessed to murdering him. In short, Dr. Beyer’s consistent performance (indeed his “specialty”) appears to be the cover-up of murder by declaration of suicide! In the case of Vincent Foster, the question must be asked if Dr. Beyer, given his past history, changed a non-fatal neck wound seen by witnesses at Fort Marcy Park into a fatal head shot needed for the suicide cover up. THE FOSTER AUTOPSY AND PROOF THAT X-RAYS WERE TAKEN. DOCUMENTED PROOF OF A WOUND ON FOSTER’S NECK CONCEALED BY THE OFFICIAL AUTOPSY, AND THE FBI MEMO THAT CONFIRMS THERE WAS NO EXIT WOUND TO THE BACK OF FOSTER’S HEAD! Long before the actual release of Kenneth Starr’s report on Vincent Foster, and despite an appearance of a sincere effort at investigation, there were indications of an impending continuance of the cover-up started by Starr’s predecessor, Robert Fiske (the BCCI lawyer). The first indication came with Starr’s handling of investigator Miquel Rodriquez’ conflicts with fellow investigator Mark Touhey. Rodriquez had uncovered what he thought was clear evidence of a cover-up in the death of Vincent Foster; in hindsight it would be almost impossible not to. By way of example, Rodriguez had taken the 35mm negatives taken at the Fort Marcy Park location, which had been declared unusable, and taken them to an outside image enhancement lab which succeeded in recovering images from the negatives. Under normal circumstances, one would assume such a success at recovering data would meet with approval, but such was not to be. Rodriguez came under severe criticism and opposition from fellow investigator Mark Touhey. When Rodriguez took the conflict to Kenneth Starr, Starr backed Touhey and Rodriguez was forced to resign, his enhanced photographs of the crime scene have never been released. Further confirmation of Starr’s intentions came when the FBI records regarding the showing of a silver gun to Lisa Foster first surfaced. Hugh Sprunt, in one of his many meetings with investigators from Kenneth Starr’s office, informed them of this discovery. Starr’s investigators, echoing the claims being put out on the internet at the time, assured Hugh Sprunt that the photo leaked by the White House to Reuter’s was quite misleading with regard to the gun’s color, and that it was reasonable to consider the gun to be of “silver color”. As can be seen by the high quality photographs of the gun released as part of Allan Favish’s Freedom Of Information Act lawsuit, the gun is quite dark, and not to be confused with a shiny silver gun. With such an obvious pander to the official story coming from the lips of Starr’s own investigators, it therefore came as no surprise that Kenneth Starr’s report on Vincent Foster continued the claim of suicide. But unlike the Fiske Report, Starr’s Report had something new. It had an addendum. This addendum had been submitted by the attorney for Patrick Knowlton, John Clarke, and had been added to Starr’s Report by the three-judge panel supervising his work over Starr’s strenuous objections! The addendum so undermined the conclusions of Starr’s report that Starr had it published in a second, separate volume from his own report. Copies of the Starr report were then distributed to the media without the second volume. Most Americans to this day are not aware of the existence of the court ordered addendum to the Starr Report. Kenneth Starr caught in a lie. In his report on Vincent Foster, Kenneth Starr attempted to resolve some of the lingering questions regarding the claim of suicide. 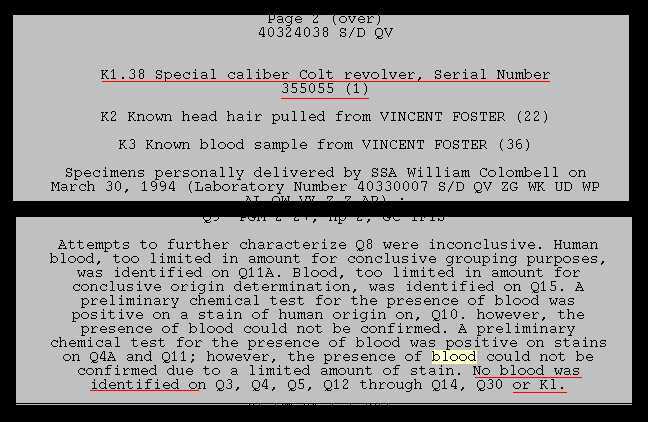 One such question involved the dark blued steel gun found with Foster’s body (the gun that the FBI had fraudulently tried to link to Vincent Foster) which did not have any of his fingerprints on it. Kenneth Starr included in his report the comment that glove box of Vincent Foster’s car contained an oven mitt. Dr. Henry Lee had concluded that Vincent Foster had carried the dark blued steel revolver to Fort Marcy Park inside the oven mitt and that this explained the lack of fingerprints. Of course, there is a huge logic flaw in the claim. Star reports that the oven mitt was left in the car, photographed inside the glove box by the Park Police the very next day. Foster would therefore have to have carried the dark blued steel revolver with him from the car, without the protection of the oven mitt, then placed it inside his mouth and pulled the trigger. The presence of the oven mitt in the glove box therefore does not explain the lack of fingerprints on the dark blued steel revolver found next to Foster’s body. While there may be legitimate reasons for an oven mitt to be in the glove box there is some question as to whether the oven mitt was really in Foster’s car as represented by Kenneth Starr. Starr states that the oven mitt was photographed by the Park Police in their impound lot the day after Foster’s body was found, July 21st, 1993. And, in the photographs from Allan Favish’s FOIA lawsuit, there are photographs showing an oven mitt quite prominently on display inside the glove box. But there is a problem. 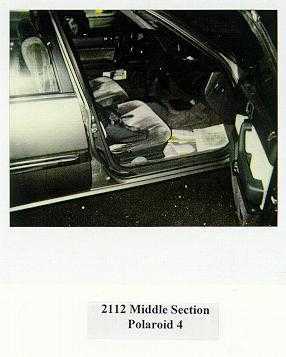 A photograph taken at Fort Marcy Park the night of July 20th 1993 clearly shows debris on the passenger side floor. In the Park Police records, Detective Braun emptied the glove box of all items PRIOR to detective Smith removing and cataloguing the debris from the passenger seat floor. Records show Braun emptying the glove box prior to leaving the Park Police impound lot as 6:35 AM July 21st. Detective Smith’s paperwork has him cleaning off the passenger side floor after noon on July 21st. 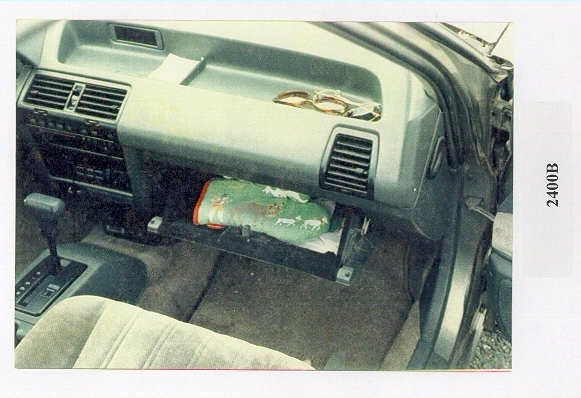 Clearly, a photograph showing the glove box with items in it over a clean passenger side floor is in direct contradiction to the Park Police record of the search of Foster’s car. The photographs of the oven mitt appear to be after-the-fact stagings at best, complete frauds at worst. When Detective Braun emptied the glove box from Vincent Foster’s car, her inventory did not record the presence of an oven mitt. It’s easy to simply dismiss Lisa Foster as the hapless victim of a tragedy, and to (as so many supporters of the suicide theory have argued) declare her off-limits in any analysis of the events surrounding the death of her first husband. However, there are indications that Lisa Foster has had her own suspicions regarding just how her husband died. When John Rolla first arrived at the Foster’s D.C. home to inform Lisa Foster of the discovery of her husband’s body at Fort Marcy Park, Rolla noted an unusual event in his report. What Rolla saw fit to comment on was the strange reaction of Lisa Foster to Rolla’s describing the gun found with her husband’s body, in which at the mention of the gun’s color Lisa simply exits the room in a highly emotional state. In Lisa Foster’s FBI interview it was established that the only gun that was in the Foster’s Washington D.C. Residence was a chrome plated revolver. It is apparent that Lisa would have had to know that the black gun being described to her by Rolla was not her husband’s. But rather than say anything about the discrepancy, Lisa Foster simply terminated the discussion. Yet another indication of acquiescence if not complicity was found in Lisa Foster’s New Yorker interview, basically a spin piece in which Lisa Foster talked about the stresses of the preceding two years but said nothing to challenge the suicide theory of her husband’s death. Now, at the time Lisa Foster did this interview, she had to know deception existed in the case. John Rolla had told her that the gun found with her husband’s body was black. Lisa knew that the black gun could not be the Foster family’s silver gun. When shown a photograph of the dark blued steel gun she did not identify it. But by the time this interview took place, she had been through the FBI interview in which a silver gun was presented to her as the gun found with her husband’s body! Lisa Foster did not comment on the magically changed gun during the interview, nor did she take the opportunity to mention the issue during her interview with the New Yorker. It’s important not to ascribe a sinister motive to Lisa Foster’s actions. A mother who has seen her children lose one parent and is reasonably concerned that they not lose another easily explains them. Shortly after the New Yorker interview, Lisa Foster married Judge Moody in Arkansas. Shortly after that, Moody’s son Neil was killed in a high-speed traffic accident. Witnesses reported he was being pursued at the time of the crash. No sooner had questions surfaced regarding the circumstances of Vincent Foster’s death than a crowd of people surged forth to assure America that Vincent Foster had indeed been depressed even though he had clearly concealed it from everyone around him. Leading the attack was CBS “60 Minutes”, which had openly admitted biasing its handling of the Gennifer Flower’s segment in 1992 to help Bill Clinton win the nomination. Quit a far cry from the media handling of Gary Hart’s infidelities! So, when reporter Chris Ruddy started writing a series of article for the New York Post regarding the inconsistencies in the Vincent Foster case, “60 Minutes” again stepped again to Bill Clinton’s defense with a hit piece on Ruddy. The mis-reporting was so outrageous and error filled that Accuracy in Media and issued some highly critical reports, as did Congressman Dan Burton. Next came a segment of the A&E program “Inside Investigations” with Bill Kurtis, which attempted to explain the absence of fingerprints on the gun found with Foster’s body by showing how the deep grooves of a modern automatic pistol simply do not provide the surfaces needed to capture fingerprints. That Foster’s body was not found with a modern automatic pistol with deep grooves and heavy texturing, but with a smooth metal revolver, was not mentioned. The extreme lengths that Mike Wallace went to attack those who doubted the official suicide story resulted in the following cartoon. Writing books in support of the official lie has become a growth industry with "Blood Sport” and "Washington Tragedy” being prime examples. In the book Blood Sport (page 284), Susan Thomases describes a meeting in her room at a private boarding house in which Vincent Foster "unburdened himself” to her. Our spies have succeeded in locating and photographing the room, just so that you get an idea of what life in service to the White House is like. “Blood Sport”, hailed as the true telling of the Foster suicide, was so filled with errors that author James Stewert, a Columbia University Professor, described the gun found with Vincent Foster’ body as “silver colored” (obviously having read the FBI files from the Lisa Foster interview). Stewert’s public reaction to the black gun. The above two pages are from a transcript of the Diane Rehm Show on WAMU FM 88.5 in Washington D.C. The in-studio guest is James Stewert. A caller, “Larry”, points out to James Stewert the fact that the gun found with Foster is actually black. Stewert tries to equivocate, then simply yanks the plug on Larry. This transcript makes clear that Stewert KNOWS he is in error on the gun color, and is refusing to acknowledge its implications. Ergo, Stewert and his book are purely propaganda! Articles from Chris Ruddy, Dave Martin, and selected journalists. With the mainstream media having abandoned its self-proclaimed role of watchdog against government abuse, the public at large began to seek other, less traditional venues to display their awareness. 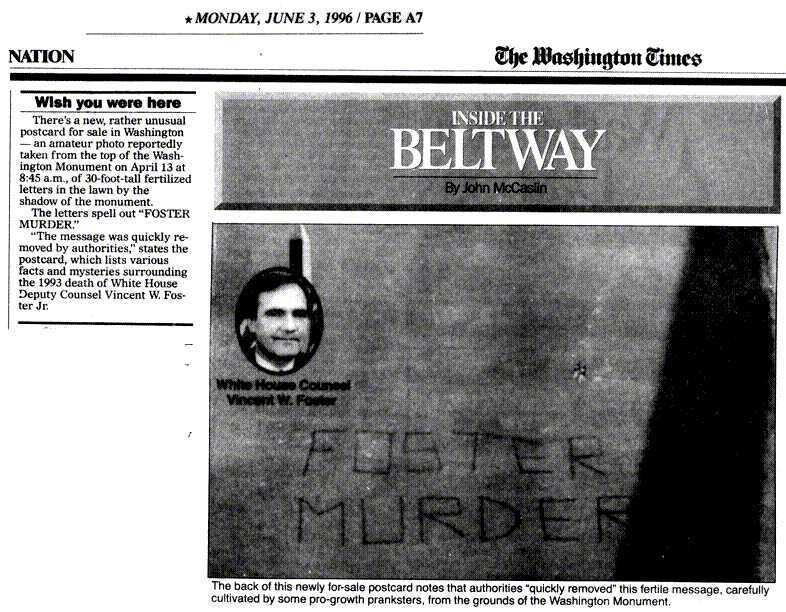 An unknown party traced out the words “Foster murder” at the base of the Washington Monument, using garden fertilizer! This prompted the following news story. Hardly had the National Park service removed the lettering and as the aroma wafted unnoticed across the Capitol Building, the photographs of the fertilizer words appeared as an underground postcard. Distributed from one Internet activist to the next, the networks and even the White House itself were flooded with these postcards mailed from across the nation. Visit Patrick Knowlton and John Clarke’s new Vince Foster website, featuring the court documents which expose the cover-up. Chris Ruddy’s postcard, not as much fun as the above, was quite a bit more informative! In advance of a project at the CNN building in Hollywood, I made up the above as a T-shirt and wore it to the office the last few days I was there. The photo is the one of Foster’s hand leaked by the White House, and the text above it is scanned from the actual part of the FBI’s FD-302a which proves that Lisa Foster was shown a silver gun by the FBI. Talk about if looks could kill! The graphic is reproduced here and permission is granted to make up your own T-shirts with it. Have fun. Piss off a mainstream media covert asset today! “Don’t believe a word you hear. It was not suicide. It couldn’t have been.” -Assistant Attorney General Webster Hubbell, 7/20/93, cited in Esquire, 11/93.